Special Thanks to Skip To My Lou for allowing me to guest post! Read the guest post here. I loved making this countdown for them! Don’t forget to stop by my Etsy Shop to check out some of the other Christmas Countdown designs, including this super cute Candy Cane stripe version! This is it. That magical time of year when all thoughts are flung forward to a fleeting couple of days that represent the climax of our year. Whether its family, presents, egg nog or snow that you’re looking forward to, you can bet that the big day will sneak up on you. Its natural, after all, with the shopping, baking and preparing going on. You just lose track. Fear not, there is a solution! Check out this super easy and really neat paper countdown calendar! 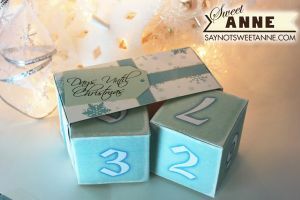 Its the perfect size to adorn a desk at work, or a mantel at home, and it will keep you up to date on how many days you have until showtime! Download this free countdown calendar here. 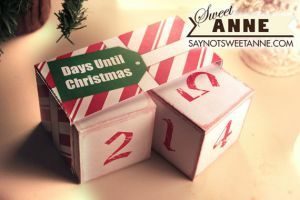 For more countdowns, part favors, gift boxes, cards and more- visit my Etsy store! The warmest Holiday Wishes to you all! Thank you for this printable! It is absolutely adorable!! !